In the market for a turnkey NAS solution? Whether you're a home user seeking a central store for family photos, or a business wanting to run intensive applications, Synology is a brand that tends to come highly recommended. And for good reason, as the Taiwanese manufacturer has built-up an extensive catalogue of award-winning units, ranging from single-bay hard disk to 24 solid-state drives. How do you build on what's already a comprehensive portfolio? 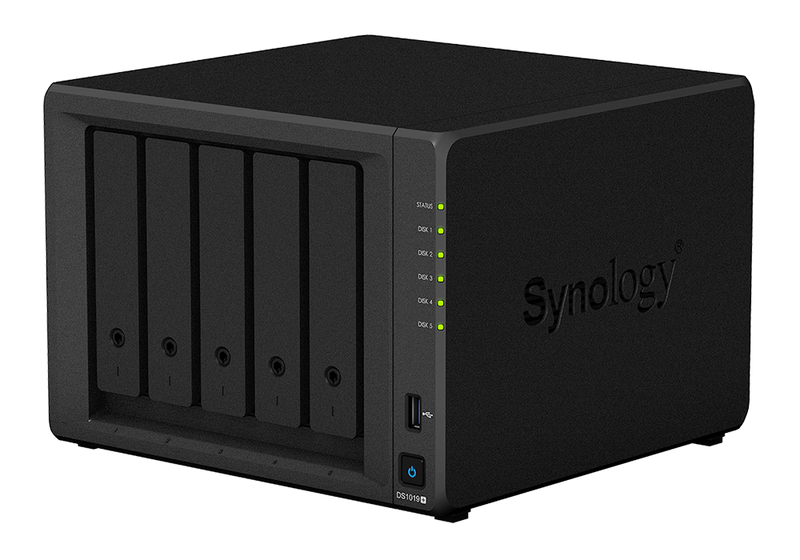 To find out, we're taking a look at Synology's latest addition, the five-bay DS1019+. Priced at $650 (£600), the DS1019+ slots in above the similar four-bay DS918+ and, at first glance, the two units have plenty in common. 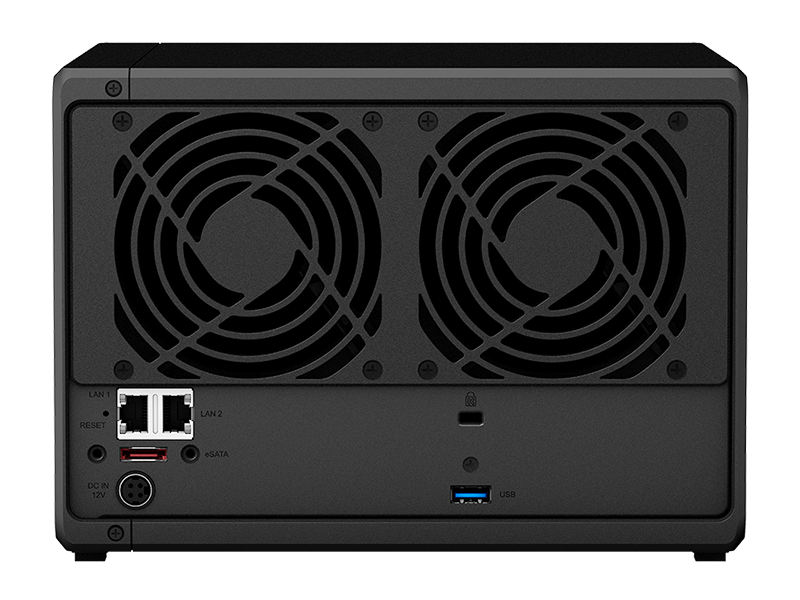 In keeping with its smaller sibling, the DS1019+ continues to employ a quad-core Intel Celeron J3455 and Synology's naming convention doesn't give a great deal away. Suggesting that this is essentially the same box with an extra built-in bay, the '10' signals the maximum number of bays (following expansion), the '19' references the year of release, and the '+' identifies the firm's higher-performing products. Is there more to the DS1019+ than that? Maintaining a familiar design aesthetic, Synology's black box is constructed using a plastic shell that, while not luxurious, is neatly knitted together and easy to work with. All five drive trays are easy to remove, and though they too are of plastic construction, we like the fact that Synology uses rubber standoffs and a tool-free mechanism for inserting 3.5in disks. Those who prefer to use 2.5in drives will find a set of screws in the bundle, as well as a pair of plastic keys for locking each individual bay. The extra layer of security is always welcome, but the locks on offer here don't feel particularly robust - they'll help prevent a child from accidentally releasing a disk, but don't rely on them to keep serious intruders at bay. Five bays ought to be plenty given the capacity of today's latest disks, however the DS1019+ does have two further bays hidden underneath. Like the DS918+, flipping the unit over reveals a removable panel that provides access to two M.2 2280 slots, designed to allow NVMe SSDs to serve as an ultra-fast system cache. Do note that these bays are for caching use only, and can't be configured as part of the primary array. Dimensions of 166mm (H) x 230mm (W) x 223mm (D) make the five-bay option a fraction larger than last year's DS918+, yet this remains a relatively compact chassis due to the use of an external 120W power supply and a relatively basic set of connectivity options. The front of the unit is home to a column of status LEDs, a power button a single USB 3.0 port. There's no one-touch copy button, but Synology gets around that via software - you can easily configure the box to automatically copy contents from an attached drive to a designated folder. 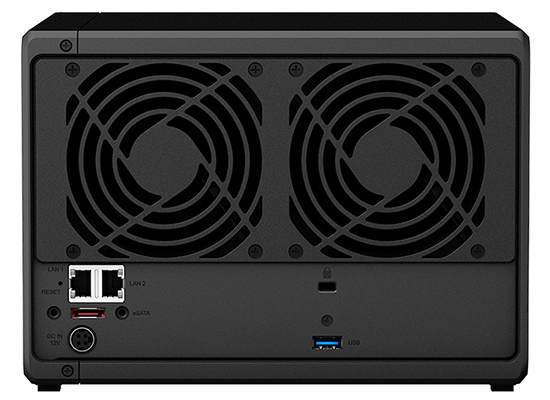 Around back you'll find a pair of 92mm fans, two Gigabit Ethernet ports supporting link aggregation or failover, eSATA for hassle-free expansion with the optional five-bay DX517, a connector for the external power supply and a second USB 3.0 port. Ample for most usage scenarios? Perhaps, but we had hoped to see Synology take things further in 2019. We'd like to see USB 3.1 Type-C start to feature as standard, it's a shame the DS1019+ continues to use a proprietary power port, and if you've got one eye on the future, you may lament the absence of forward-looking features such as PCIe expansion and 10GbE. On the inside, the Intel Celeron J3455 processor continues to serve as a popular choice for NAS manufacturers, and Synology partners the chip with 8GB (2x4GB) of DDR3L memory, up from 4GB on the DS918+. The extra memory is welcome, particularly for those planning on using the box for more demanding tasks such as virtualisation, but do note that 8GB is the maximum amount of memory supported, meaning there's no room to upgrade further down the line. The inability to upgrade is arguably the DS1019+'s biggest drawback. We've seen some of Synology's Atom-based units offer PCIe expansion in the past, and while the Intel Celeron chip on offer here offers native support for hardware 4K transcoding, there isn't currently a best-of-both-worlds solution in the firm's five-bay catalogue. As it stands, the DS1019+ has the benefit of M.2 caching and 4K transcoding, while the older DS1517+ offers quad LAN ports and PCIe expansion. It's a case of picking the unit that better suits your usage scenario, but given the lower price point, we suspect the DS1019+ will prove popular. 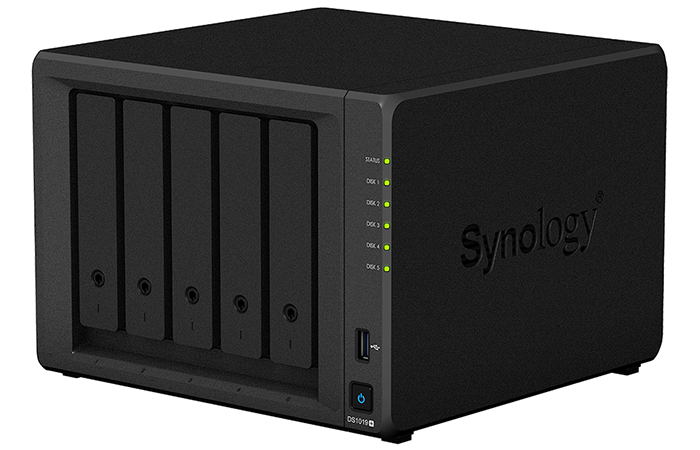 Truth be told, hardware prowess isn't the primary reason to choose a Synology NAS. Experienced users will point out that it's cheaper to build a far more powerful server of your own, and they'd be right, but the value of a Synology unit is realised in the best-in-class DiskStation Manager (DSM) operating system. Offering a level of polish that is, in our estimation, unmatched in the SOHO NAS marketplace, the web-based DSM is easy for users of all backgrounds to get to grips with and packed with a feature-set that's about as extensive as they come. Whether you're storing family photos, managing an entire workplace, serving multimedia via Plex, or testing software in a virtual environment, DSM puts everything within reach. 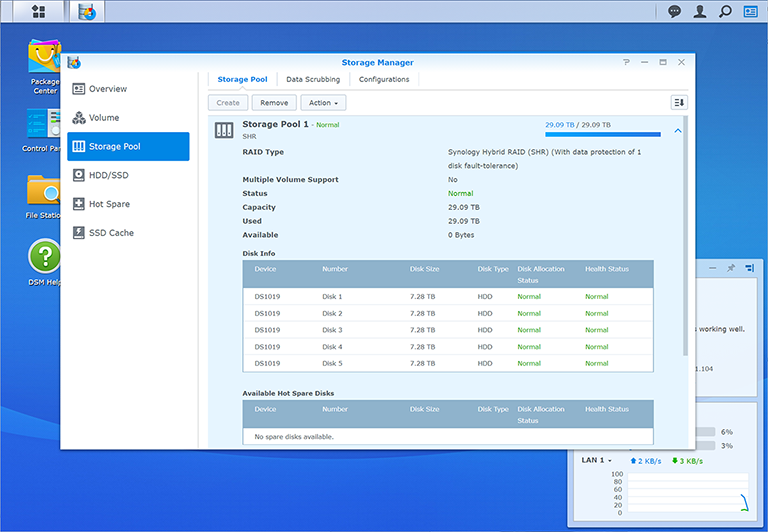 Ease of use and presentation are major plus points, and once-complicated tasks such as configuring RAID arrays with mixed-size drives is a piece of cake thanks to features such as Synology's Hybrid RAID. Getting up and running is so simple that the only real question is which hard disks should you use? 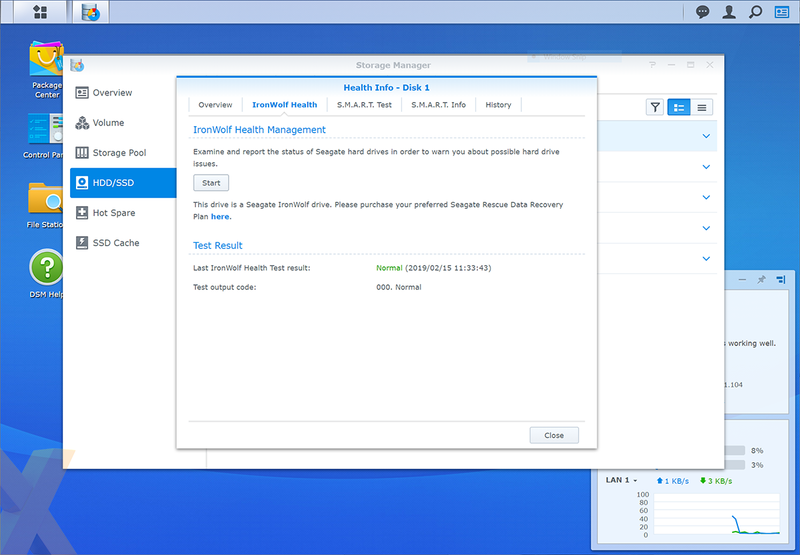 We've used WD Reds in the past, but having switched to 8TB Seagate IronWolf drives, we're pleased to find that DSM includes native support for IronWolf Health Management (IHM). Effectively a souped-up alternative to basic SMART tests, IHM is said to monitor in excess of 200 drive parameters in an effort to keep the user aware of any issues that may develop. Our drives, thankfully, passed the test with flying colours, so let's now run some benchmarks.